Leroy: "We must continue to bring energy, passion and fighting spirit to every part of the business." Toyota President Akio Toyoda made news this spring when he spoke of "a sense of crisis" within the automaker. His words came as the company braced for two years of declining profits and he said Toyota would streamline its operations to improve the bottom line. 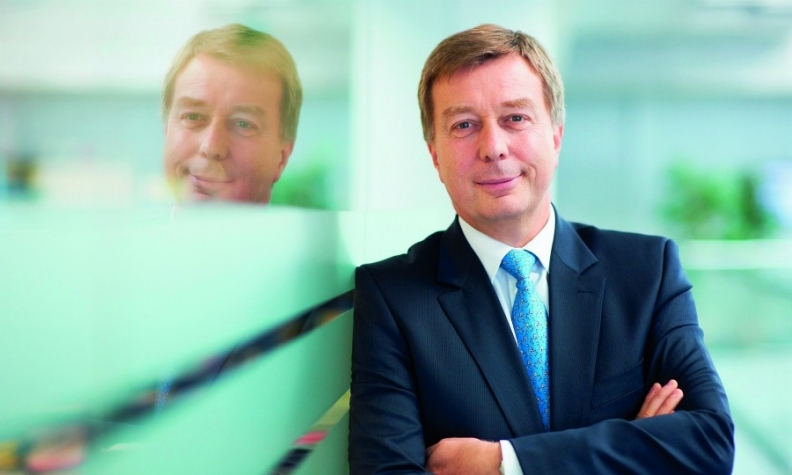 One of the people tasked with executing Toyoda's vision is Frenchman Didier Leroy, who is Toyota’s first non-Japanese executive vice president as well as the company’s chief competitive officer and president of business planning and operation. Leroy explained how Toyota is meeting the challenges that lie ahead during a recent interview with Automotive News Europe Correspondent Peter Sigal. You have many roles at Toyota and you're responsible for many regions. How do you balance those jobs? Akio Toyoda is very clear about his expectations for me as an executive vice president. His expectation is that I act as a real entrepreneur: It's your company, your money, you make decisions with a fully entrepreneurial spirit. Is that level of autonomy normal? Before Akio Toyoda became president, each executive vice president had a very siloed role and responsibility. He asks us to take a wider view and to really think about what we should do to strengthen the company in the future. There is a great deal of consistency between my three positions: As executive vice president, I need to think about what direction we should take in the future and what strategy we should have, without any borders. My role as chief competitive officer is consistent with my role as EVP because if we want to secure our future in the long term, we must continue to bring energy, passion and fighting spirit to every part of the business. Then, as president of business planning and operation, there is a lot of consistency with the other two jobs because I'm covering the world. My biggest challenge is how to be close to employees -- I need to travel a lot to bring them this energy. How do you define competitiveness? People often talk about competitiveness in terms of KPIs [key performance indicators], such as evaluating productivity and so on. Frankly, anyone can do that. The difference in our idea of competitiveness is that the starting point is human resources development. It's much more important than any KPI. It's based on how we can identify and develop the right leaders, to make things happen and keep a strong fighting spirit and passion in everything we do. Akio Toyoda said this spring that he was feeling a "sense of crisis" about operations throughout the company. What does that mean to you, and how is Toyota responding to his words? "Sense of crisis" means that it doesn't matter if you are successful today, if you have lots of cash, if you have a big market share, if you have 10 million unit sales. It doesn't mean that you are protected in the future. Everything can be destroyed in just a few years. MAIN CHALLENGE: Maintaining urgency and motivation among Toyota's workforce as it adapts to the industry's biggest changes. What steps can Toyota take to avoid complacency and maintain a high level of motivation in its employees when things are going well? One thing that is clear to us is that traditional kaizen [the philosophy of continuous improvement] is not enough. We must keep kaizen because it is one of the strong foundations of Toyota, but we have to make breakthroughs by changing the way we work. We have started new companies such as the Toyota Research Institute and Toyota Connected. We now have a lot of joint ventures with startups. By changing the way we work, we are much more open to the external world. Several years ago, everybody thought Toyota wanted to do everything itself and that Toyota only wanted to work with companies in the Toyota group. That's not the case anymore. This is something that was strongly pushed by Akio Toyoda when he became president. It's been reported that you are part of a task force to find cost savings. Is that accurate? Competitiveness cannot be based just on cost savings. As I often say, I never see anybody jumping on the table to say, "Yes! My boss asked me for 20 percent cost savings." Of course, cutting costs is a must in the organization, but if you start by talking about cost savings -- like many companies are doing -- you will never succeed. If you think about how to create passion and a fighting spirit for the future, the cost reductions will be the result of those actions and not the target. When you strongly motivate your workers, there is high potential that they will come up with 25 percent cost reductions by themselves. In Europe, Toyota's sales growth has been well above the market average. What do you attribute that to, and what are your sales targets for this year? We have three criteria for steady and sustainable growth in Europe. One, we have developed a strong differentiator with our hybrid technology. The second point is new products, such as the RAV4 hybrid and the C-HR [compact crossover] that arrived last year, and the new Yaris that debuts this year. The third is that we continue to make a lot of effort to attract more and more customers through product appeal and customer service. We should remain modest -- our market share is still between 4.5 and 5 percent at the pan-European level, but we are in the top five in half the countries we cover in Europe. This year we plan to sell 975,000 units [in Europe, which includes Turkey and Russia] which is better than last year when we sold 928,000 units. What prevents Toyota from making a big leap in market share in Europe? We should be realistic -- if you look at Japan, 75 percent of the market is covered by four brands. In the U.S., six brands account for 75 percent of the market. However, in Europe the first 75 percent of sales is covered by 13 brands. If you expect us to be like we are in the U.S., at around 14 percent market share, or in Japan, at 47 percent, this does not exist. No individual brand is at this level in Europe. Despite steady and sustainable sales increases, Europe has not necessarily been the biggest profit center for Toyota. Why? Some companies have disappeared from Europe because they lost money for years. We are not losing money. Over the past few years, our profitability has been at 3 to 4 percent at the pan-European level, which is much lower than in the U.S. However, you don't see [high-margin vehicles such as] Tundras, Highlanders or Tacomas on the streets here. Competitiveness also means what is our profitability versus others, and clearly we are not so bad. But you're right, this is not at all our most profitable region in the world. Nevertheless, this is a region where we battle many strong companies and in many ways it is the heart of the global automotive business. Are you satisfied with Toyota's production footprint in Europe? Yes. Seventy percent of what we sell in Europe is produced in Europe. Our logic and strategy for our manufacturing activity is the following: When we establish a plant, we make sure we achieve at least the same level of quality as our factory in Japan. That means the Yaris produced in Valenciennes [France] is as good as the Vitz produced in Japan. Then we create a strong kaizen spirit, we involve the workers to make sure that they bring new ideas and innovation to improve the performance of their factory. Our factories outside Japan are often benchmarks in terms of the way we manage people and our relationships with unions. One of the big challenges for the UK plants now is how to stay competitive after Brexit. We trust the British government to remain open, but if it cannot succeed in [establishing] free trade with the EU-27, it could be severe for the UK. At the same time, we believe that in our UK factories in Burnaston and Deeside, the workers' motivation is extremely high. They demonstrate every single day that they have a lot of ideas, a lot of kaizen, a lot of proposals to improve the performance of the factory. We trust them and we really expect that we will be able to stay competitive in the UK. New French President Emmanuel Macron wants to change the French work rules to make it easier to hire and fire and provide employers more flexibility. What would you like to see from that effort? Everything that can make manufacturing in France more competitive is, of course, more than welcome. But this kind of change will succeed only if it's a win-win between companies and workers. Companies will have more competitiveness versus what is happening in the world and at the same time many French citizens will find a new job. This is what I call a win-win. It will be challenging, but I think President Macron has very good ideas and a strong desire to change the country. The key thing now is to make it happen.